The link between writing and drinking is a tradition that has spanned centuries. 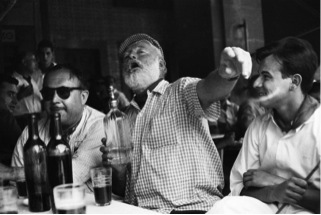 Most writers are well aware of the tales of Hemingway drinking his way from Havana to Paris, Carver and Cheever spending more time at The Mill Bar than teaching at Iowa, Bukowski stumbling into and through readings; I could go on, but I think you get my point. Many artists believe that the muse is found at the bottom of a bottle. If that were true, then I’ve spent enough time in a pub to have written the great American novel. Twice. The loosening of inhibitions should, in theory, allow the writer to tap into their subconscious to find that brilliant idea or character that leads to the dream of all writers: publication, fame, and the ultimate eternal voice that will be taught to generations of writers to come. I asked myself, is this true? Someone should do scientific research on this very subject, so, why not me? (Probably because I’m horribly underqualified both as a scientist and a “writer”) I grabbed a flask of whiskey and a notepad, and headed out the door to find out first hand if the muse was really hiding in a pub waiting to be awoken by the combination of booze, people watching, and an unfamiliar setting. It was at that point that my wife grabbed me by the ear, took away my flask, sat me in front of my computer, and opened Google on my browser. The results were shocking. I fully intended to find nothing but articles denouncing my idea, and making me feel like an idiot. My original thought for this post was to point out that the muse was actually found on the journey to the pub. For example, a trek to the famous literary watering hole, White Horse Tavern in the West Village of Manhattan, starts in Grand Central Terminal for all those like me that rely on Metro North to get into the city. Grand Central is a gold mine for people watching. Without being aware, the subconscious stores endless amounts of information. From the smell of roasted nuts to the iridescent shimmer on a pigeon’s wings and the waves of diverse people doing things in public one never thinks of (nor wants to). From there a walk to Times Square, again observing, hearing a mix of languages, smelling that odd steam rising from the concrete sidewalks, a bouquet of senses difficult to find anywhere else in the world. You take the subway to 14th street; do I really need to mention what can be experienced in a New York subway? A half mile walk through Greenwich (I promise these are the right directions to get there) and you are at the pub where Dylan Thomas had his last whiskey and Jack Kerouac was thrown out so many times that the words, “Jack go home,” are still scrawled on bathroom walls. It has also been recognized as one of the most haunted bars in New York. Beer and shot glasses have known to appear on Thomas’s favorite table. Without consuming a sip of alcohol, the mind has absorbed hundreds of ideas, whether one knows it or not. But how does the writer access and process everything that has been taken in and get it down on paper? According to science (I like to think of science as a collective group of all knowing people), a moderate amount of alcohol is the actual cure for writer’s block. There is an amazing article, “Uncorking the muse: Alcohol intoxication facilitates creative problem solving,” by actual scientists Andrew F. Jarosz, Gregory J.H. Colflesh, and Jennifer Wiley. (I titled my blog post before I found this article, I swear.) Purchase students can access this article through the Purchase College Library; just search for the article. It is otherwise impossible to find online without paying for it. There are a few other articles that reference the study, and are good reads, on Medical Daily and The Huffington Post that support drinking, to a point, is good for creative thinking and problem solving (which can be useful in editing). 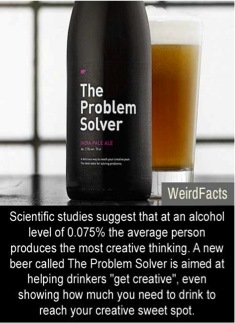 I particularly like the Problem Solver Beer, which provides an accurate way to get to peak creativity. To see how all the experiments are done, I’m going to refer you to the article. Again, I am not a person of scientific integrity, so to skip to the results that many want to hear (to justify having a drink or two before writing), I will quote the article, “The results of the current study supported the prediction that moderate alcohol intoxication would improve performance on a creative problem solving task.” I would like to mention that these results are only for those over the age of 21 and the keyword in this is MODERATION. 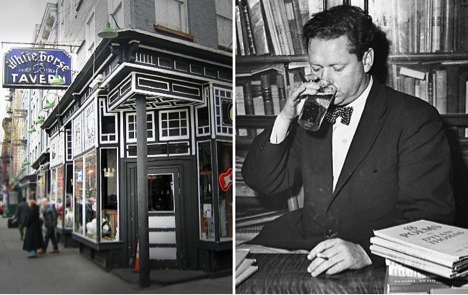 The final drink that Dylan Thomas had at the White Horse was said to be his 18th whiskey of the evening; he died. There is no ONE way to find your muse. I actually came up with the first half of this post in the shower. Many ideas I have come up with arrive in that state between sleep and consciousness, just before falling asleep, and just after waking up. Some people read newspaper articles, some people-watch, some travel, some are just so naturally gifted with imagination that they just sit down in front of a computer typing up winner after winner – I hate those people. (Ok, not really hate, but I am extremely jealous.) My point is this: the muse is everywhere. But maybe, if you’re having a bit of trouble finding her, a little drink could go a long way.